B Sharp School of Music inspires students of all ages to “sharpen their minds through music.” The private music school, started by Heidi Garcia, operates out of an old Victorian house in downtown Lodi, CA, with a recently opened second location in Scotts Valley. But, as business grew, the process became tedious, and Loeb sought a way to automate student check-in. He found The Receptionist for iPad. “I tried out many apps,” he says. “But when I saw The Receptionist for iPad, it really stood out because I had control over the interface. I found a creative way to set up the system so it takes attendance for me.” Now, rather than creating attendance reports by hand, he can do it quickly and easily using the visitor log. Teachers sign in and out on The Receptionist for iPad as well, so Loeb always knows who’s in the building. The Receptionist for iPad also serves as a recordkeeping tool for the school’s accounting process. B Sharp pays teachers based on how many students they see each month, so it’s important that this information is accurate. Not only does the system keep track of student volume, but teachers receive text notifications when their students sign in. This helps everyone stay on the same page when payday rolls around. Finally, B Sharp uses the app to communicate with teachers. Loeb customized their check-in screen to display messages, such as meeting reminders. “I figured out a way to use all of The Receptionist for iPad’s features so it can be a multifaceted tool for our organization,” he says. We love playing a role in making day-to-day operations at B-Sharp easier and more efficient. 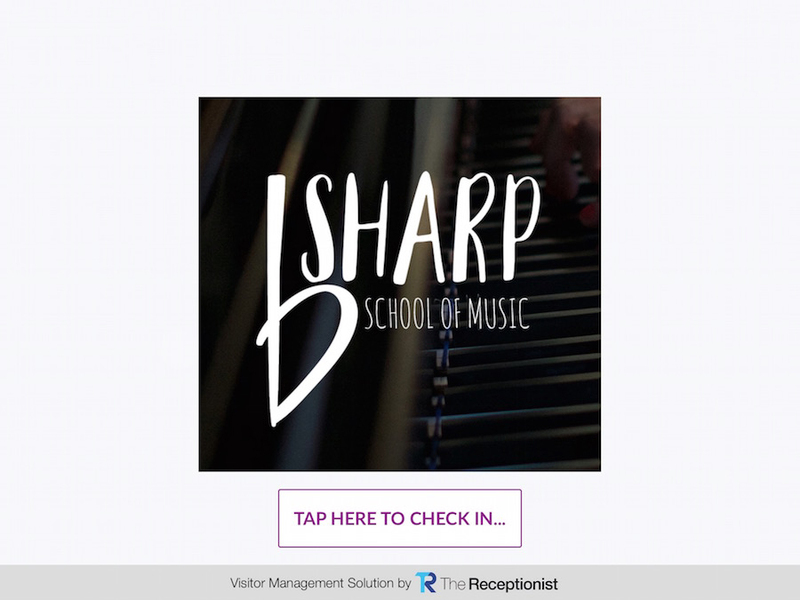 Do you want to see how The Receptionist can help your school or small business? Start your free 14-day trial today. At B Sharp School of Music, our goal is not to just give music lessons, but to inspire our students and our community through this rich and diverse language. Our mission is to sharpen minds through music. Time and time again, music has been proven to improve the lives of those who engage with it. Be it fine motor skills, personal discipline, improved concentration, or even working well with others, music is so much more than just a hobby. It is an expression of life well lived.